The first four times the No. 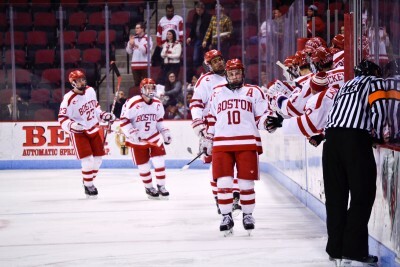 9 Boston University men’s hockey team took the lead against the University of Massachusetts Amherst in the second game of the teams’ first-round Hockey East Tournament matchup, it gave a goal back. Even though UMass (8-24-4) never led during the game, it managed to hang around, bugging the Terriers (21-10-5) — much like it had for most of the series — and tied the game four straight times. “We just couldn’t get a two-goal lead,” said BU coach David Quinn. But BU didn’t let a tying goal happen a fifth time. Freshman forward Jakob Forsbacka Karlsson took the last goal of the weekend with 8:09 remaining, and BU edged UMass, 5-4, to advance to the quarterfinals of the Hockey East playoffs. BU, which played its final game at home on Saturday after sweeping UMass following a 2-1 overtime win Friday night, will travel to face the No. 11 University of Massachusetts Lowell for the best-of-three series beginning Friday. UMass ended its season with the loss. Senior assistant captain Danny O’Regan recorded two goals and two assists on the evening, becoming the 18th player in program history to total at least 150 career points and the first since Chris Drury hit the milestone during his junior year in 1996-97. Including the game-winner, Forsbacka Karlsson also had two goals on the evening, while freshman defenseman Charlie McAvoy added four assists on the evening, doubling his career high in points for a game. Forsbacka Karlsson took advantage of gaps on UMass goaltender Nic Renyard’s left side twice, with the final tie-breaking goal sailing through an open space after several Terriers couldn’t get one through to the net. Just 5:40 into the first period, Forsbacka Karlsson opened the scoring when he found space on Renyard’s left side and swatted the puck in from midair, giving the Terriers a 1-0 lead. The game marked Forsbacka Karlsson’s first contest with a goal since Jan. 22, and his first two-goal game since Nov. 14. At 8:33, however, UMass forward Dennis Kravchenko bounced a puck off BU goaltender Sean Maguire to knot the score at 1-1. O’Regan scored the first of his two goals on the evening — and his 150th career point — when his shot sailed from the left circle past Renyard at 5:53 of the second period. Walsh tied things back up at 2-2, when at 11:13 his shot snuck between Maguire’s left side and the goal post. Grzelcyk then added his 10th goal of the season to give BU a 3-2 advantage at 12:39 of the second period with a strike from the left point. Forward Kurt Keats brought UMass back to a 3-3 tie at 17:50 of the second after forward Austin Plevy got around BU junior defenseman Doyle Somerby to pass to an open Keats. But O’Regan got his second goal of the evening just 55 seconds later when he scooped up a puck right in front of the net off an initial pass from freshman forward Jordan Greenway. UMass forward Austin Plevy tied the game again, 4-4, at 3:51 of the third period, when he chipped in a rebound from the low slot off defenseman Callum Fryer’s initial shot. And while they couldn’t get up by a couple goals, Forsbacka Karlsson’s final tally proved to be enough for the Terriers. A night after he posted a career-high 46 saves, Renyard had 38 stops in the contest on BU’s 43 shots on goal. Maguire posted 32 saves for the Terriers in his Agganis Arena finale, ending his home career with a .939 career save percentage in the building. While Maguire and BU’s five other seniors will never play another game at Agganis — all remaining playoff games will happen on the road for the Terriers — O’Regan noted that their home finale would be special to remember.